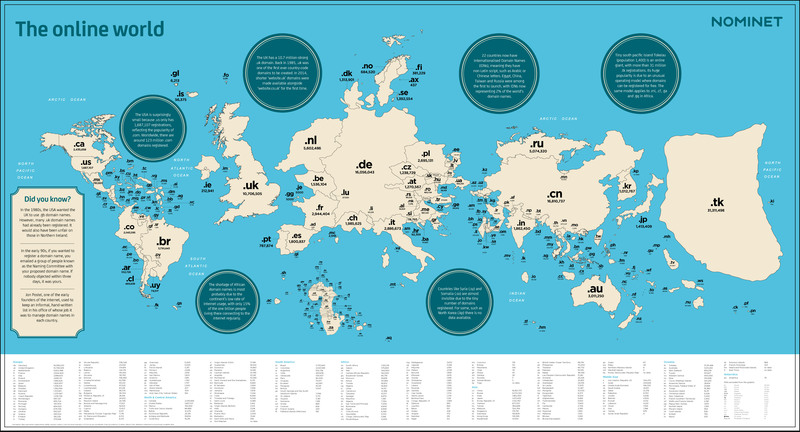 The world in domains: The registration service Nominet has recently published an interesting graphic of the international internet world and their domains. At first glance, this map of the world seems fairly normal, nothing out of the ordinary. But, upon closer inspection, there seems to be a few countries that are slightly out of proportion! Firstly, the USA’s .us domain is surprisingly small. This can be explained by the popularity of .com in the USA, coupled with the fact that the United States is the worldwide leader in modern top-level domains that are specific to industries, interests, or income. Moving eastwards across the map, Germany’s .de domain size is surprising, particularly when you note that there’s almost as many .de domains as there are .cn domains in China. Perhaps more surprising still is that the Netherlands and Russia have the same number of domains, given their vastly different population sizes. But then, on the far right-hand side of the map, comes the most surprising country image of all: Tokelau. It’s been almost 26 years since the first ever internet web page went online. In the meantime, more than 314 million domains have been registered worldwide, according to April 2016’s Verisign Domain Report. The internet industry continues to record steady growth, with an increase in domains of 9% compared to the same period in 2015. Domain endings have changed over the years as well. The classics like .info or .com dominated the early period of the internet, but this meant that all of the best website addresses were snapped up. Today, there are more top-level domains (TLDs) on offer than ever before, including .beauty, .dance, or .chicago. Despite these increases, .com remains the most popular ending worldwide: Around 123 million domains are registered with the .com TLD. So which domain endings are in pursuit? As mentioned above, the country code .cn is has slightly more than Germany, at close to 17 million domains. It would make sense for China to have the highest number of country-specific top-level domains in the world, given that it has the highest population of any country, with over 1.38 billion people residing there. But, strangely, it’s only second place in the Verisign list of top country domain endings, and third across all top-level domains. .tk, the country-specific domain ending for Tokelau, is used by over 31 million websites worldwide. Given that Tokelau’s population is around 1,400, and the island group owned by New Zealand was ranked lowest in the world for purchasing power parity by the CIA in their 2015 publication ‘The World Factbook’. So how exactly does such a small, poor, remote part of the world wind up being the second most popular top-level domain of choice worldwide? If you’ve already heard of Tokelau, you’re in the minority: the country is far from a typical tourist destination. Looking for historical landmarks, attractions, and points of interest on Tokelau is as futile as looking for an airport there. This tiny group of islands in the South Pacific is more or less cut off from the rest of the world. A ship travels there and back once every two weeks from Samoa, but beyond that there’s very little infrastructure to speak of, let alone a tourism industry. What the three atolls in the middle of the Pacific Ocean do offer is deserted beaches, unspoiled nature and a completely isolated oasis of seclusion. This picturesque island dream sounds too corny to be true. Just like the story of how Tokelau ended up becoming a giant player in the online world. Over 31 million websites use the official Tokelau domain ending .tk. Compare this to 11 million registered websites with the .uk ending in the United Kingdom, 2.5 million with the .ca ending for Canada, and just 1.7 million with the .us TLD in The States. Given its population of roughly 1,400, it would be inconceivable that these domains were all registered to inhabitants of the South Pacific island. So who exactly are the website operators running .tk domains from outside of Tokelau? Behind all this is a simple, but profitable idea. At first, registering a domain was a free and easy process, but competition has since made domain trading a very lucrative business. And the Tolekau story begins in 2000, when a Dutch company started a registration service specialized for .tk domains. But why did it choose to market the TLD of this remote island state? This answer to this question is simple – because the .tk top-level domain could be registered for absolutely nothing. Today, users can take out the .tk domain for free for 12 months, before then having to pay a small subscription fee. If the user decides against a cost-based subscription for the Tokelau domain after 12 months, or if a .tk web page goes unused for a certain period of time, the DOT TK website operators monetize the web page traffic and display ads on the web page. The domain name registry DOT TK sustains itself financially through this ad display income. But this isn’t exploitation: the inhabitants of Tokelau also profit from this, with part of the advertising revenue going to the island state. This may not seem like much, but it actually makes up a substantial part of the gross domestic product for the country with the lowest purchasing power parity by GDP worldwide. And when you compare Tokelau’s population with the number of registered .tk domains, you can start to understand just how significant this is.